Entirely new Solitaire Game! Match cards to clear the decks, get valuable rewards. No hurry, no rush. Smart and sometimes crafty ways to score Show off your skills and score big! You can simply remove similar cards. But you can make color matches, suit matches, use boosters smartly and draw up Perfect Matches to be #1! Valuable achievements You deserve them! Really valuable achievements bring you coins to purchase boosters that charge your game. Useful Boosters Spend your coins on useful boosters to overcome those challenging levels and enhance your game experience. Hours, days and even months of fun! 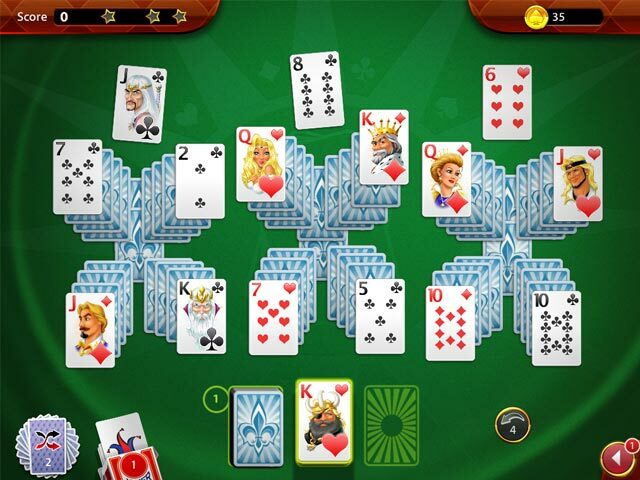 Solitaire Perfect Match is rated 3.1 out of 5 by 26. 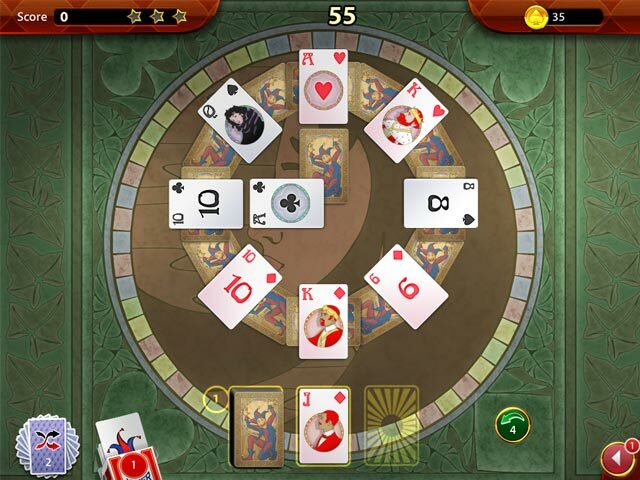 Rated 5 out of 5 by bloominrose1 from Great solitaire game - can't stop playing it I have played this game over and over for days/weeks/months and love it. Only problem is that now I am stuck on Level 76 Magic Carpet and can't win it. I posted on Forum and am hoping someone can help. Rated 5 out of 5 by unclepam11 from awesome! best solitaire game ive ever played!!! will there be a sequel????? Rated 5 out of 5 by almawings from Great Game - well worth downloading had this game on my Kindle - the only problem with playing it on my Kindle was I only had 5 time chances to get it right to advance to the next game. Then I would have to wait until it charged again to let me play. This on the pc - there is no timing on the levels, which is great. I am stuck on level 17, but I will eventually get passed it, it will take time. Rated 5 out of 5 by coffeeguy from My New Go-To Game This game joins the ranks of my all-time favorites. I'm don't understand the reviews where people wrote they were so bored. Maybe they must have only played the first couple of levels. Because after those first few levels I needed every brain cell left to pull together to get three stars. It's very addicting..."After this hand I am going to bed"....[15 minutes later], "THIS is REALLY the last hand and then I am going to bed." Believe me, it is far from boring. The best part about this game is that is gives my brain a serious workout and having great fun at the same time. Rated 5 out of 5 by mrm2006 from Well .... it's ..... Different.....But Maybe that's EXACTLY what grabbed me! I don't believe I've ever "met" a solitaire game that was quite so ..... unusual. All you do is make matches (i.e., 4 and another 4, King and another King) with bonuses for having the same suit or even color! No Hi/low or anything else. But,...... it's certainly enticing and made me want to go back for more ..... and more ..... and even MORE! The music was upbeat but not annoyingly so. The little mustachioed man gives the impression of "hmmm ... sly little devil .... better watch out for him." But, I'm not even really sure you see him again. The colors/graphics are bright, easy to see cards (for those of us who are of the more mature persuasion) I could not see where the card backs, etc. could be changed. Too bad. I'm also not sure WHAT i get so many rewards for or why I never have enough coins to purchase upgrades or help. So, you see, I can't really tell you anything at all! Except, it kept me quite unusually involved in the game play and I HATED (and I dislike the word "hate") when the demo ended! Will this be a purchase for me? YOU BET! If for no other reason that to figure out ..... just what makes this game so appealing! ENJOY! 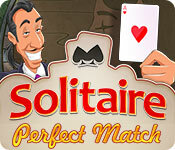 Rated 5 out of 5 by pennmom36 from Perfect Match, Perfect Solitaire! Finally, something new and unique in a solitaire game! This type of solitaire game requires you to make matches of the same card, not necessarily the same suit, but if you match the same colors, you score a higher multiplier, AND if you make a PERFECT MATCH, same number, same suit, same exact card you get even more points. Before each level you will be able to choose Boosters, a Reserve Deck (gives you 2 cards at a time, which will also allow you to make matches within the deck for points), Jokers (places two wild cards randomly within the deck), and Undo (which allows you extra chances to undo a missed match). You earn trophies as well which gives you coins, but you must go into the trophy room and accept the trophy to get the coins associated with that achievement. The coins you earn can be used to purchase bonuses which help you achieve the level goal and hopefully earn three gold stars per level. You can buy a Stock Pile (shows how many cards are left in the deck), an Ace In The Hole (3 joker wild cards), Pack Of Jokers (10 extra joker wild cards), Ouch (3 extra undo's), Reshuffle Fund (10 extra reshuffles), or Insurance (10 extra undo's). Some of the bonuses can be purchased while still trying to master a hand, if you run out of Jokers, or undo's for example, if you click on the icon and they have been depleted, it will add another one and just deduct the coins from your earnings. Sit back and relax with this game, it's a game well worth the bucks, enjoy! Rated 5 out of 5 by dachsy from New Fun Solitaire! This solitaire game grabbed me from the get-go with bright, bouncy graphics, nice music, and a seemingly new way to play solitaire. The basic idea is to match pairs of cards. If you can match both colour and suit in one pair, your score multiplier keeps increasing until you cannot match the colour you are currently on...and going by the demo, you certainly will need to try and do this as much as possible. As you play, you earn coins which can be spent on 'boosters' which assist you in play. There are requirements to obtain in each hand, and you are awarded up to 3 Stars if you obtain them. Some of these coins turn up on cards randomly, and you have to try and pair the card as quickly as possible. These coins are of a certain value and count downwards as soon as they appear, so you have to be quick to maximise their value. The deck can be turned over and replayed up to three times, which is a nice feature. Even so, I was still on the 'Warm Up' round at the end of the demo, as the 'Stars' were not easy to obtain. The music, whilst quite nice, could not be adjusted in volume. So you either have it on or off. Sound effects and gameplay are excellent. 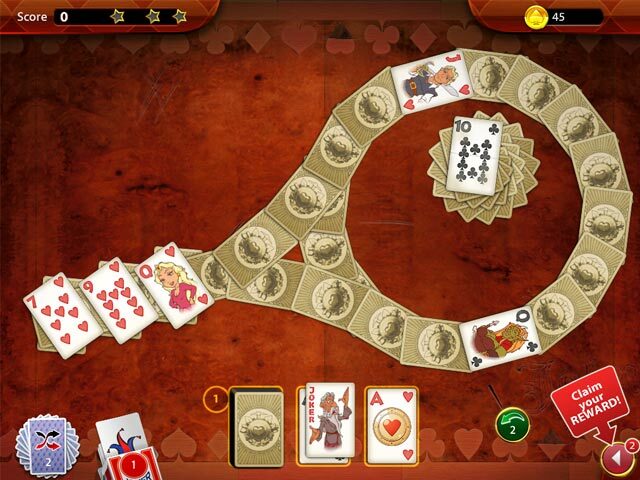 Any solitaire fan will definitely want to try this game which I think is by a new developer. It is certainly a breath of fresh air. Entirely new Solitaire Game! Match cards to clear the decks, get valuable rewards.